This program is designed for students of all language levels who wish to focus their studies primarily on Spanish language acquisition and who want to learn about Latin America. The program also offers electives in Spanish. Learn about Latin America through specific courses in film, literature, history, business, and cultural studies. Improve your language skills through organized opportunities for cultural engagement. 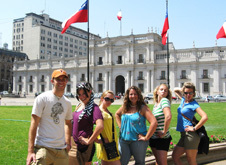 As Chile's premiere seaside resort, Viña del Mar provides a great stepping stone to a semester or summer of Spanish language and Latin American cultural study. Many say that Viña del Mar offers a more relaxed, friendlier lifestyle than Chile's capital city of Santiago, even though it's just a short drive away. Viña del Mar is conveniently located, providing easy access to Chile's many natural wonders. The country's topography ranges from the Andes Mountains and arid deserts in the north, to sandy beaches and stunning lakes in the south. Home to a large number of parks and gardens – thus earning it's reputation as the "Garden City" –, Viña del Mar is also known for its annual International Song Festival. Hone your Spanish language skills while experiencing and absorbing all that Chilean culture has to offer through hands-on excursions to nearby Santiago, a trip to Isla Negra, -- home to the famous Chilean poet, Pablo Neruda, or a tour of the Casablanca wineries and the grape harvest.